Cook with Claire: Cycle For Survival: To Fitzy. Love, Goldie. Cycle For Survival: To Fitzy. Love, Goldie. I can't think of a better post for Valentine's Day. You all know that I love my friend Fitzy and her boys. She is a dear friend and I cherish our friendship. When I met Suzanne she had been a widow for two years. Her husband David died of a rare form of cancer called Cholangiocarcinoma, or cancer of the bile duct. When he was diagnosed the doctor predicted that he only had 6 months to live. Unfortunately, the doctor was correct. Cholangiocarcinoma is rare and extremely hard to diagnose. Most patients only find out they have it when it is too late to stop the disease. The survival rate is close to zero. It has been 10 years since David died. Suzanne is an exceptional parent in every way. She has been mother and father to her boys and has done an amazing job every step of the way. Our family feels blessed to count Suzanne, Jack, and Josh as our very good friends. David died too young and has missed seeing his wonderful boys grow up into exceptional young men. 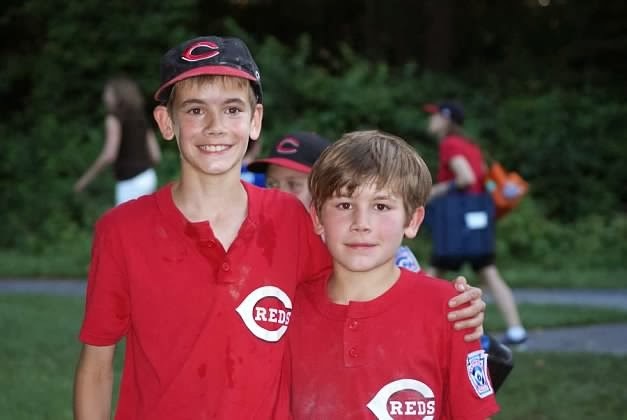 Surely David would have been so proud to see the boys attain straight As on every report card, watch Jack score the winning home run in the Little League playoffs, and hear Josh play a moving trumpet solo of the National Anthem that brought the parents at our PTA meeting to tears. All moments none of us should take for granted. My husband Matt is participating in the Cycle for Survival next week. He is biking in memory of David - - husband of Suzanne, father of Jack and Josh. If you feel inspired to help in the fight against rare cancers view his page here.